Jennie Connors, Activities Director of Riverview Manor, has been promoted out of the job she loves. But there’s one thing she wants to do before she steps up to her new position: Jake Appleton, known among the other residents as Sour Appleton, needs to be integrated into the retirement community’s social life. It won’t be easy. Jake spends his days alone, staring out the window and mumbling that the world is full of crooks. Has he witnessed wrongdoing in the construction project going on outside his window? Or is he looking back over his own life? Jake’s not telling; he shares his thoughts only in his journal. Jennie doesn’t give up – and, finally, one morning Jake surprises her. He taps the journal, tells her “it’s all in here” and agrees to talk to her later that afternoon. But someone gets there first. She finds Jake with a bullet in his head. The journal is gone−and Jennie is determined to find it and solve the puzzle of a lonely old man and restore peace of mind to the residents she loves. Residents, including the not-so-sweet tea ladies and an old actor who takes seriously "all the world's a stage", refuse to be left out. 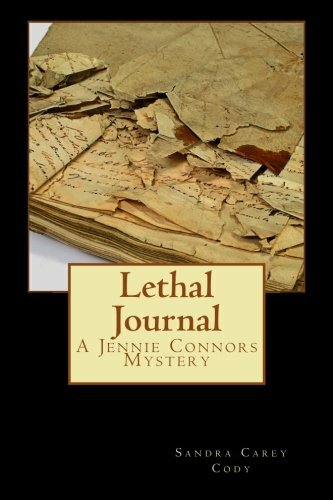 Filled with lovable, quirky characters, Lethal Journal is, by turns, sweet, funny and sad. Readers have praised the Jennie Connors mysteries as having such heart that it's almost impossible not to fall in love with the characters. I can't think of anything I'd rather have readers say about my books or their characters. Sandra Carey Cody was born and grew up in Missouri, surrounded by a family who loved stories, whether from a book or told on the front porch. She's lived in various cities in different parts of the country and can honestly say she's loved them all. She's currently living in a picture-perfect small town just north of Philadelphia. Wherever She's gone, books have been the bridge to her new community and new friends.